TUNICA HILLS MUSIC FEST AND JAM!! The Wilder Janes is a Baton Rouge band formed in 2013 of three musicians from three parts of Louisiana making original music with an original sound. All women sing lead and harmony and are also multi instrumentalists. Sounds range from harp and marimba to banjo and mandolin, upright bass and guitar, and various percussion. Since each of them write songs, the voice of the song is always fresh in sonic tones and in lyrical perspective. Attend their shows and you will find full houses of misty-eyed listeners hanging on every shift of lush vocal and instrumental harmony. There's no girl group kitsch, just a break from the noise and action of the everyday world where for a moment everything is in synchrony. 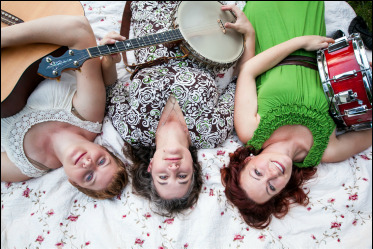 The Wilder Janes are Becca Babin, Heather Feierabend (pronounced fire-robin), and Melissa Wilson.